This relatively small NNR is an absolute gem and is home to possibly the largest colony of Marsh Fritillary Butterflies (Euphydryas aurinia) in Britain. Other butterfly species thrive there, too, along with numerous dragonflies and damselflies, soif you are interested in insects this NNR cannot be missed. Of course, good insect life presupposes good plantlife without which insects cannot survive, and Rhos Llawr Cwrt is home to very special plants including the internationally threatened Slender Green Feather Moss (Hamatocaulis vernicosus). Purple Moor Grass is a dominant feature of the Reserve, and in its tussocks lives the diminutive Harvest Mouse (Micromys minutus) which is, no doubt, one of the reasons why Barn Owls (Tyto alba) are frequently seen hunting across the pastures. The small Bwdram Stream runs through the reserve, and signs of Otters (Lutra lutra) have been observed on its banks. 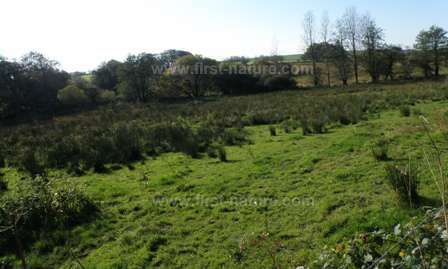 The site is owned and managed by Natural Resources Wales (NRW). From Aberaeron take the A487 towards Cardigan. At the Synod Inn crossroads turn left onto the A486 towards Llandysul and then almost immediately turn left again towards Talgarreg on the B4338. Once in the village of Talgarreg continue through the village but do not take the left turn onto the continuation of the B4338. Turn right about 500m (1/4 mile) beyond the disused Post Office (see picture below right) and continue down the lane signed towards Crug Eryr Isaf Holiday Cottages for approximately 1km (2/3 mile). Turn left into the lane signed towards Llawcwrt Farm and then left again at the CCW offices sign. There is parking for only 6 vehicles in the site car park, and cars are not to drive or park beyond the designated parking area. There is a track running through part of the reserve, but the going is wet underfoot at best and boggy and hazardous at worst. NRW welcomes visitors but asks that you call at the office prior to entering the reserve so that staff can advise you of the parts of the reserve that must be avoided; some areas are grazed by cattle and their calves, and others are dangerous. On days when the site office is unmanned you should proceed with extreme caution. The farmhouse and outbuildings (other than the clearly marked site office) are private property and visitors are requested not to wander around the yard. Dogs are not permitted in this nature reserve. Stout, waterproof shoes are a necessity when visiting Rhos Llawr Cwrt NNR. There are no public toilets on site, and the office is only manned a few days during the week. 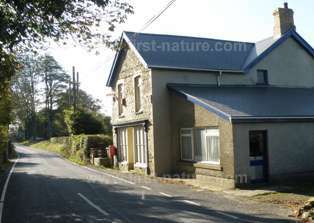 Shops, pubs and cafés can be found in the surrounding villages and also at Aberaeron. The Welsh word Rhos is taken to mean rough and usually wet pasture in this part of Wales, and the tradition of grazing ponies and cattle on the land at Rhos Llawr Cwrt continues as part of the management of the site and helps to keep rank vegetation under control. There is a small area of oak woodland within the NNR, and other habitats include peatland, bog and sedge-rich grassland. The wet areas have Wild Angelica (Angelica sylvestris) growing there, and in the slightly drier areas there are Heath Spotted-orchids (Dactylorhiza maculata) and Northern Marsh-orchids (Dactylorhiza purpurella) flowering in late May and June. 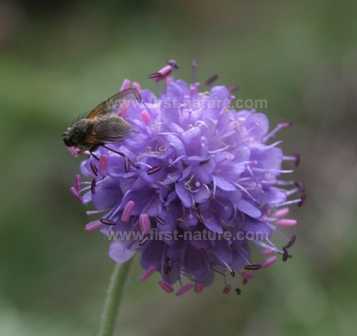 The plant that makes this NNR so attractive to the Marsh Fritillary Butterflies is Devil's-bit Scabious (Succisa pratensis) - the food plant of that butterfly's caterpillars. 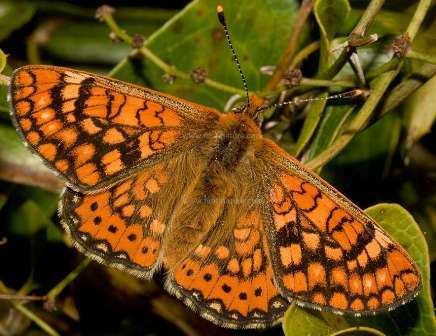 A visit in August is the best time to see the caterpillars feeding on the plant, but if you visit on a sunny day in late May or June you may see literally thousands of adult Marsh Fritillaries. It is estimated that between ten and twenty thousand are present at Rhos Llawr Cwrt in a good year. Other butterflies that put in an appearance on the Reserve are the Green Hairstreak (Callophrys rubi) and the Small Pearl-bordered Fritillary (Boloria selene). Some of the other plants that make this reserve such a special place include Whorled Caraway (Carum verticillatum), Sneezewort (Achillea ptarmica), Bitter Vetch (Vicia orobus), Heath Milkwort (Polygala serpyllifolia) and Common Marsh-bedstraw (Galium palustre). Rhos Llawr Cwrt NNR is a lovely nature reserve to visit in the summer when the pastures are ablaze with wildflowers and the air is alive with the buzzing of insects.